Formation of the autophagosome requires significant membrane input from cellular organelles. However, no direct evidence has been developed to link autophagic factors and the mobilization of membranes to generate the phagophore. Previously, we established a cell-free LC3 lipidation reaction to identify the ER-Golgi intermediate compartment (ERGIC) as a membrane source for LC3 lipidation, a key step of autophagosome biogenesis (Ge et al., eLife 2013; 2:e00947). We now report that starvation activation of autophagic phosphotidylinositol-3 kinase (PI3K) induces the generation of small vesicles active in LC3 lipidation. Subcellular fractionation studies identified the ERGIC as the donor membrane in the generation of small lipidation-active vesicles. COPII proteins are recruited to the ERGIC membrane in starved cells, dependent on active PI3K. We conclude that starvation activates the autophagic PI3K, which in turn induces the recruitment of COPII to the ERGIC to bud LC3 lipidation-active vesicles as one potential membrane source of the autophagosome. Macroautophagy (hereafter autophagy) is a conserved cellular process wherein cytoplasmic protein and organelles are packaged and delivered to the lysosome to promote survival under conditions of stress (Choi et al., 2013; Jiang and Mizushima, 2014; Mizushima et al., 2008). The process begins with the formation of a double-membrane organelle, termed the autophagosome, which envelops part of the cytoplasm for targeting to and degradation in the lysosome (Burman and Ktistakis, 2010; Weidberg et al., 2011; Hamasaki et al., 2013b; Lamb et al., 2013; Ge et al., 2014). Completion of the autophagosome requires step-wise acquisition of membranes from intracellular organelles directed by proteins devoted to autophagy (Mizushima et al., 2011; Rubinsztein et al., 2012; Abada and Elazar, 2014; Feng et al., 2014). How an endomembrane organelle responds to an autophagic signal to generate autophagosomal precursors is unclear. A direct link between the autophagic signal and the biogenesis of the phagophore membrane is the autophagic phosphotidylinositol-3 kinase (PI3K) complex (VPS34, VPS15, Beclin-1 and ATG14)-mediated production of phosphotidylinositol-3 phosphate (PI3P), an event triggered by starvation (Sun et al., 2008; Matsunaga et al., 2010; Obara and Ohsumi, 2011). We have previously established a cell-free LC3 lipidation reaction that is dependent on PI3K and its lipid product, PI3P (Ge and Schekman, 2013; Ge et al., 2013). In Atg5 knockout (KO) mouse embryonic fibroblasts (MEF), which are deficient in the terminal step of the LC3 lipidation cascade, autophagosome formation is blocked downstream of the PI3K pathway (Mizushima et al., 2001; Suzuki et al., 2007; Itakura and Mizushima, 2010). Therefore, membrane precursors acting between the PI3K pathway and phagophore maturation may accumulate in Atg5 KO MEFs after starvation. To study the PI3K-induced early event, we employed the lipidation assay to compare the sensitivity to PI3K inhibition between membranes from untreated and starved Atg5 KO MEFs (Figure 1A). Consistent with the previous study, lipidation of LC3 on the untreated membrane was efficiently blocked by a PI3K inhibitor 3-methyladenine (3-MA, ∼sevenfold decrease of activity with the indicated concentration of 3-MA, Figure 1B) or the PI3P blocker FYVE domain protein (∼ninefold and 18-fold decrease of activity with the indicated concentration of FYVE protein, Figure 1C) (Stenmark and Aasland, 1999; Axe et al., 2008). However, LC3 lipidation promoted with membranes from starved cells was less sensitive to 3-MA or FYVE domain protein inhibition (∼threefold decrease with the indicated concentration of 3-MA, Figure 1B, and ∼twofold and fourfold decrease with indicated concentration of FYVE domain protein, Figure 1C), indicating that a later autophagosomal precursor, bypassing the need of PI3K for LC3 lipidation, was generated in response to starvation in Atg5 KO MEFs. Starvation and PI3K-dependent generation of small membranes for LC3 lipidation. (A–C) Atg5 KO MEFs were either untreated (NT) or starved (ST) with EBSS (Earle's Balanced Salt Solution) for 30 min. Total membranes (mem) from lysed cells were collected and incubated in a lipidation reaction with cytosols prepared from starved HEK293T cells. Reactions contained the indicated concentrations of PI3K inhibitor (PI3KI) 3-methyladenine (3-MA) (B) or FYVE protein (C). A diagram of the experimental scheme is shown in (A). RPN1, Ribophorin 1 (D, E) Atg5 KO MEFs were either untreated (NT) or starved (ST) with EBSS in the absence or presence of 20 nM wortmannin (Wtm) or 10 mM 3-methyladenine (3-MA) for 30 min. Membranes from each treated cell sample were collected and subjected to a differential centrifugation to separate the 3K ×g, 25K ×g and 100K ×g pellet fractions followed by a lipidation assay as above (E). A diagram is shown in (D). (F, G) Atg5 KO MEFs were starved for 30 min. Membranes in the 25K ×g and 100K ×g pellets from a differential centrifugation were collected as described above. A similar lipidation assay was performed in the presence of indicated concentrations (Conc in G) of 3-MA, wortmannin (F) and FYVE protein as well as a PI3P binding-deficient FYVE mutant protein (C/S) (G). Quantification of lipidation activity is shown as the ratio of LC3-II to LC3-I (II/I). To separate the precursor membranes active in LC3 lipidation as well as to determine the requirement of PI3K in generating them, we took membrane samples of untreated or starved Atg5 KO MEFs incubated with or without PI3K inhibitors. A differential centrifugation protocol similar to that described in our previous study (Ge et al., 2013) was performed with lysed cell preparations followed by incubation of membranes under conditions that promote the lipidation of LC3 (Figure 1D). Consistent with the previous result (Ge et al., 2013), the 25K membrane from untreated cells had the highest activity whereas neither the 3K nor the 100K membrane pellet fractions had comparable activity (∼1/7 and 1/3 of the activity of the 25K membrane in the 3K and 100K membrane respectively, Figure 1E). Starvation or PI3K inhibition did not substantially affect the lipidation activity in the 3K or 25K fractions (Figure 1E). However, the 100K membrane from starved cells, mainly containing small vesicles, displayed a ∼1.5-fold increase of lipidation activity compared to that of membranes from untreated cells (Figure 1E). Addition of PI3K inhibitors to cells during starvation abolished the increase of lipidation activity in the 100K membrane induced by starvation (Figure 1E). Therefore, starvation induces the formation of small membranes competent for LC3 lipidation in a process that requires activation of the PI3K. To test if the membrane precursors generated by starvation is a downstream effect of PI3K activation, we performed the lipidation assay with the 100K membrane and compared its sensitivity to PI3K inhibition as well as PI3P occlusion with the 25K membrane (Figure 1F) which contains the ER-Golgi intermediate compartment that induces LC3 lipidation in a PI3K-dependent manner (Ge et al., 2013). Consistent with our previous result, lipidation activity in the 25K membranes was inhibited by PI3K inhibitors 3-MA and wortmannin as well as the PI3P blocker, FYVE domain protein, in a dose dependent manner (Figure 1F,G and Figure 1—figure supplement 1). In contrast, PI3K inhibitors did not inhibit lipidation activity of the 100K membranes (Figure 1F). Likewise, the FYVE domain protein was less potent in inhibiting LC3 lipidation with membranes in the 100K than the 25K pellet fraction (Figure 1G). Nonetheless, membranes in the 100K pellet fraction remained partially sensitive to the FYVE domain protein suggesting that access of PI3P in these membranes remained critical for the recruitment of factors, such as WIPI2 (Dooley et al., 2014), necessary for the lipidation event. These data suggest that membranes in the 100K fraction are generated downstream of the PI3K-dependent step. To determine if the small membranes were generated from a big donor organelle, we employed a cell-free small membrane formation reaction based on our previous work on the cell-free formation of COPII vesicles (Bednarek et al., 1995; Kim et al., 2005). A medium-speed membrane pellet fraction from lysed Atg5 KO MEFs was collected and incubated with Atg5 KO MEF cytosol together with GTP and an ATP regeneration system to generate small vesicles which were concentrated by a two-step centrifugation (Figure 2A). The LC3 lipidation reaction was performed on the slowly-sedimenting vesicles (Figure 2A). As shown in Figure 2B, COPII vesicles, marked by the reporter protein SEC22B, were generated in the presence of cytosol, membrane and nucleotide (Figure 2B). Starvation signals from the cytosol or inhibition of PI3K activity did not affect the level of budded SEC22B (Figure 2B). Slowly-sedimenting vesicles generated in this reaction supported LC3 lipidation with a ∼1.5-fold increase in lipidation activity in incubations containing cytosol from starved compared to untreated cells (Figure 2B). This stimulatory effect was compromised by addition of PI3K inhibitors during the small vesicle formation step (Figure 2B). Occlusion of PI3P by FYVE domain protein also attenuated the generation of small vesicles active in LC3 lipidation (Figure 2—figure supplement 1), consistent with the requirement for PI3P production on the donor membrane to generate the vesicles active in the lipidation of LC3. Importantly, lipidation activity promoted by the small vesicles was resistant to PI3K inhibition but remained partly sensitive to the PI3P blocker peptide, which was similar to the behavior of the 100K membrane generated from starved cells (Figure 2—figure supplement 2). The data indicate that a donor membrane generates these small vesicles in a starvation-induced and PI3K-dependent manner. COPII and PI3K-dependent generation of small vesicles from ERGIC for LC3 lipidation. (A) Diagram showing the cell-free system to generate small vesicles for LC3 lipidation. Briefly, a medium-speed membrane pellet (20K ×g, 20KP) from Atg5 KO MEFs was harvested and incubated with cytosol from Atg5 KO MEFs, GTP and an ATP regeneration system (ATPR), and in the absence or presence of PI3K inhibitors (Figure 2B) or the PI3P blocker FYVE domain protein (Figure 2—figure supplement 1). The slowly-sedimenting membranes generated were separated from the donor membrane by a medium speed centrifugation (20K ×g) and collected by high-speed sedimentation (100K ×g) of the supernatant fraction (20KS). A lipidation assay with HEK293T cytosol was performed to analyze the competency of the small membranes (100KP) to induce LC3 lipidation. (B) A small vesicle generation assay as above was performed with the indicated conditions. Slowly-sedimenting vesicles were collected to determine activity in the LC3 lipidation reaction. 3-MA, 5 mM; Wortmannin, 20 nM; S, starved Atg5 KO MEF cytosol; N, untreated Atg5 KO MEF cytosol; −/AP, in the absence of ATP regeneration and GTP and in the presence of apyrase (AP). (C) Diagram showing the fractionation procedure and fractions collected for the small vesicle generation assay shown in (D). Briefly, Atg5 KO MEF membranes were subjected to differential centrifugation to collect 3K ×g and 25K ×g pellet fractions. Sucrose gradient ultracentrifugation was performed to separate the L and P fraction after which the L was further separated by OptiPrep gradient ultracentrifugtion. Ten fractions from top to bottom were collected and combined to four as indicated (F1-4). (D) A small vesicle generation assay followed by a lipidation reaction was performed with the 3K, P and F1-4 fractions (upper four panels: Small vesicle). SDS-PAGE and immunoblot with indicated antibodies were carried out to probe the organelle enrichment of each fraction (lower five panels: Fraction input). TFR, transferrin receptor (E) A small vesicle generation assay as shown in (A) was performed in the presence of indicated proteins or drugs. Slowly-sedimenting vesicles were collected and incubated in a lipidation reaction in the presence of GST, H79G (Sar1A (H79G), 0.7 μM), wortmannin (20 nM), or BFA (brefeldin A, 0.5 μg/ml). (F) A small vesicle generation assay as shown in (A) was performed with cytosols from starved Atg5 KO MEF from control or Sec23A knockdown cells in the absence or presence of Sar1A (H79G) or 3-MA followed by a lipidation reaction. (G) Atg5 KO MEFs were starved for 30 min. Differential centrifugation as shown in Figure 1D was performed to collect the 25K ×g and 100K ×g pellet fractions. The LC3 lipidation was performed on these two fractions with indicated concentrations of SAR1 (H79G). Quantification of lipidation activity is shown as the ratio of LC3-II to LC3-I (II/I). 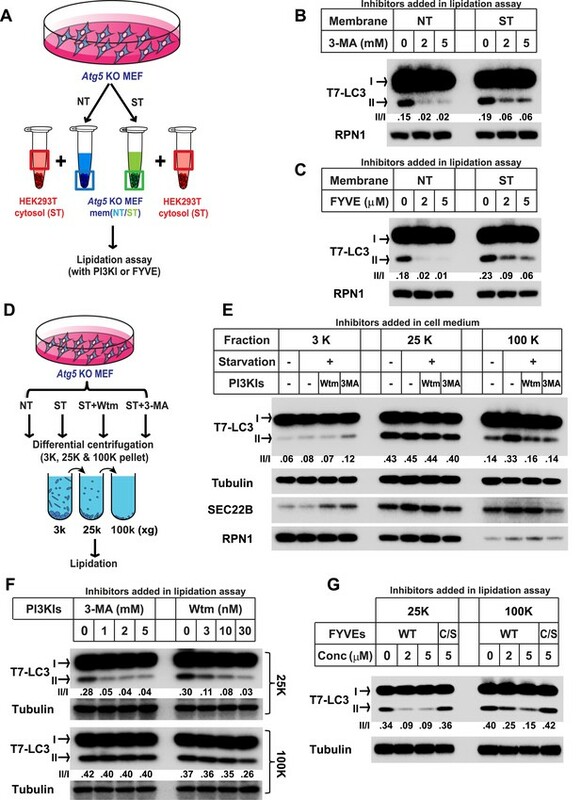 During the induction of autophagy, the serine/threonine complex containing FIP200, ULK1, ATG13 and ATG101 is activated and precedes the recruitment of the autophagic PI3K complex consisting of ATG14, Beclin-1, VPS34 and VPS15 to the target membrane. These events lead to the generation of PI3P on the local membrane to initiate autophagosome biogenesis (Burman and Ktistakis, 2010; Mizushima et al., 2011; Rubinsztein et al., 2012; Abada and Elazar, 2014; Feng et al., 2014). To test the requirement of the upstream autophagic factors involved in the generation of LC3 lipidation-active vesicles, we used RNAi to deplete FIP200, ATG14 and Beclin-1, key components of the upstream autophagic complexes, in Atg5 KO MEFs (Figure 2—figure supplement 3). Cytosol deficient in any one of these proteins reduced the efficiency with which LC3 lipidation-active vesicles were generated in the cell-free assay (Figure 2—figure supplement 3). Therefore the data suggest that the production of the lipidation-active vesicles is regulated by upstream autophagic factors. To probe the membrane source responsible for generating the small vesicles, we employed a three-step membrane fractionation approach (Ge et al., 2013) and incubated separated membrane fractions in the cell-free small vesicle formation assay (Figure 2C). The membrane template for COPII budding, marked by SEC22B and ERGIC53 (two COPII cargos generated from ER and enriched in ERGIC; Hauri et al., 2000; Mancias and Goldberg, 2007; Zhang et al., 1999), was enriched in the P fraction, where the majority of the endoplasmic reticulum (ER) sedimented (the enrichment of RPN1, an ER marker, Figure 2D). We observed that the ERGIC fraction (F2) was most active in generating small vesicles active in LC3 lipidation, although it was less active in capturing cargo proteins into COPII vesicles than membranes in the P fraction (Figure 2D). The plasma membrane and endosome fraction (marked by transferrin receptor), and the Golgi fraction (marked by GM130) were less potent in the generation of both COPII and lipidation-active vesicles (Figure 2D). To confirm the role of the ERGIC in the production of vesicles active in LC3 lipidation, immunodepletion of the ERGIC from the L fraction was performed with SEC22B antibody as described previously (Ge et al., 2013). Depletion of the ERGIC membrane decreased the generation of small vesicles marked by COPII cargos (ERGIC53 and Sec22B) and active in LC3 lipidation (Figure 2—figure supplement 4), consistent with a role for the ERGIC as the donor membrane in generating lipidation-active vesicles. COPII and COPI coats have been functionally associated with the ERGIC (Appenzeller-Herzog and Hauri, 2006; Zanetti et al., 2012; Brandizzi and Barlowe, 2013). To test if COPII and COPI are involved in the generation of lipidation active vesicles, we used a COPII inhibitor SAR1 (H79G) and a COPI inhibitor brefeldin A (BFA) (Peyroche et al., 1999; Ward et al., 2001) in the cell-free small vesicle formation assay (Figure 2E). SAR1 (H79G) inhibited COPII budding and the generation of lipidation-active vesicles whereas BFA showed a marginal effect (Figure 2E). Consistent with this, we found that cytosol collected from Sec23A-silenced Atg5 KO MEFs (Figure 2F and Figure 2—figure supplement 5A) was less active in the generation of small vesicles competent as a template for lipidation of LC3 (Figure 2F). To further characterize the role of COPII, we collected the 25K membrane pellet fraction, containing the donor membrane ERGIC, and the 100K membrane pellet fraction, enriched in autophagosomal precursors, from starved Atg5 KO MEF and then performed the LC3 lipidation assay in the presence of the SAR1 mutant (H79G). Inhibition of COPII decreased LC3 lipidation in the 25K fraction but did not affect LC3 lipidation on the 100K fraction (Figure 2G). This result is consistent with the view that COPII acts on the ERGIC membrane to generate the lipidation-active membranes, i.e. the small vesicles are downstream products of COPII budding. The above experiments were performed in autophagy-deficient Atg5 KO MEF. To test if a similar process occurred in WT cells, we performed the small vesicle generation assay with membranes from the 20K pellet fraction and cytosol collected from WT MEFs. As shown in Figure 2—figure supplement 6, small vesicles decorated with endogenous LC3 (both LC3-I and -II) were generated in a PI3K-COPII-dependent manner, whereas the packaging of COPII cargoes (SEC22B and ERGIC53) into small vesicles was COPII-dependent but PI3K-independent. Noticeably, small vesicles positive for the autophagic membrane protein ATG9 were also generated in the reaction, but in this case vesicles formed independent of PI3K or COPII (Figure 2—figure supplement 6), suggesting that this potential source of autophagosomal membrane was generated in a process distinct from that of the LC3 lipidation active vesicles. It is possible that the ATG9 vesicles come from the trans-Golgi network (TGN) as they have been shown to exit the TGN after starvation (Young et al., 2006). Due to technical limitations, it was difficult to distinguish cytosolic from peripheral vesicle-associated ATG proteins (data not shown). To determine the requirement of COPII in autophagosome biogenesis, we depleted SEC23A by RNAi in WT MEFs and Hela cells (Figure 2—figure supplement 5B, C). Depletion of SEC23A reduced the biogenesis of autophagosomes as revealed by the formation of starvation-induced lipidated LC3 without or with the lysosome inhibitor bafilomycin A1 (Figure 2—figure supplement 7A,B) as well as the reduced appearance of LC3 puncta in WT MEFs and Hela cells (Figure 2—figure supplement 7C–F). The data, together with the previous reports (Hamasaki et al., 2003; Zoppino et al., 2010; Guo et al., 2012; Ge et al., 2013; Graef et al., 2013; Tan et al., 2013), document a requirement for COPII in autophagosome biogenesis. To further probe the relationship between COPII vesicles and LC3 lipidation, we examined the distribution of SEC31A, a key component of COPII (Zanetti et al., 2012), and endogenous LC3. Under nutrient-rich conditions, a few LC3 puncta formed which did not overlap with COPII vesicles (Figure 2—figure supplement 8). As expected, starvation induced a dramatic increase in LC3 puncta. On starvation, many small LC3 puncta colocalized with SEC31A whereas larger puncta did not (Figure 2—figure supplement 8). The above data indicate that starvation activates PI3K in the ERGIC membrane followed by the action of COPII to generate vesicles that are active in lipidation of LC3. Under normal circumstances, COPII vesicles originate from ER-exit sites (ERES) and undergo at least partial uncoating before reaching the ERGIC (Zanetti et al., 2012; Brandizzi and Barlowe, 2013). Our finding of COPII vesicles budding from the ERGIC may be due to the starvation conditions used to induce autophagy. To test if COPII proteins are recruited to the ERGIC in starved cells, we incubated starved Atg5 KO MEFs with or without wortmannin. We then isolated ERGIC membrane and immunoblotted fractions with antibodies against COPII proteins (Figure 3A). Without starvation, little COPII (SEC12, SAR1A and SEC23A; Zanetti et al., 2012) was detected on the ERGIC fraction (Figure 3A). Starvation increased the distribution of the COPII machinery, SEC12, SAR1A and SEC23A, to the ERGIC whereas inhibition of PI3K reduced this relocalization (Figure 3A). 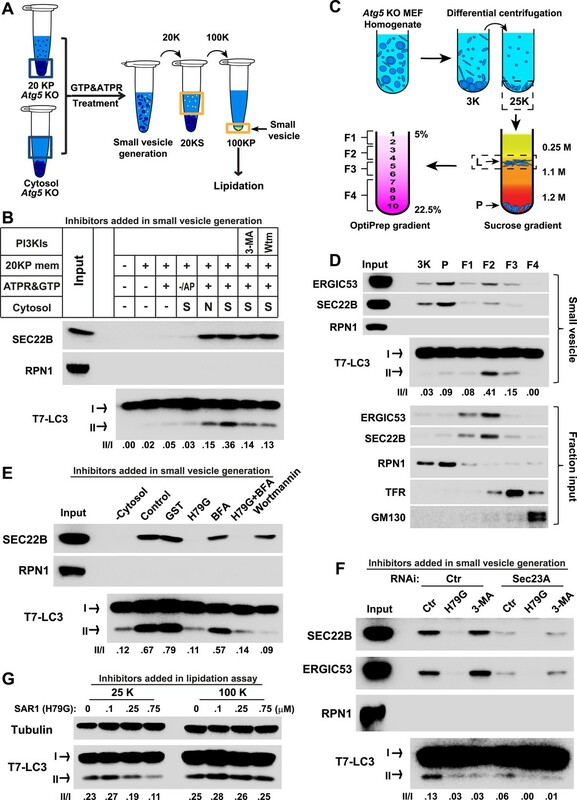 As controls, an ER resident protein, RPN1, and an ERGIC protein, SEC22B, remained at constant levels in the ERGIC fraction isolated from untreated and starved cells. As another control, localization of COPI (β-COP) on ERGIC membranes was not regulated by starvation or wortmannin (Figure 3A). We conclude that the conditions of starvation that induce autophagy result in the partial redistribution of COPII proteins and SEC12, the nucleotide exchange catalyst that activates SAR1 and initiates coat assembly, to the ERGIC membrane and that this change depends on active PI3K. PI3K-dependent recruitment of COPII to ERGIC after starvation. (A) Atg5 KO MEFs were either untreated or starved with or without 20 nM wortmannin for 30 min. Cells were harvested and ERGIC membranes were isolated by pooling fractions 3 and 4 (F2 in Figure 2C,D) of the OptiPrep gradient in the three-step fractionation approach followed by immunoblot to examine the amount of indicated markers on ERGIC membranes. (B) Atg5 KO MEFs were transfected with a plasmid encoding an HA-tagged SEC31A. After transfection (24 hr), the cells were treated as shown in (A). Immunofluorescence was performed with anti-ERGIC53 and anti-HA antibodies and the cells were examined by confocal microscopy. Bar: 10 μM (C) Quantification of SEC31A overlapped with ERGIC53 shown in (B) using the Pearson's correlation coefficient (PCC). Error bars represent standard deviations from ∼20 cells in three independent experiments. p values were calculated by T-test. (D) A proposed model. Starvation activates autophagic PI3K to induce COPII recruitment on ERGIC. COPII vesicles generated from ERGIC serve as templates for efficient LC3 lipidation. These membrane precursors may collaborate with other membranes such as the endoplasmic reticulum (ER), plasma membrane (PM), ATG9 compartment and mitochondria, to form a mature autophagosome. We examined the redistribution of COPII proteins to the ERGIC membrane by immunofluorescence confocal microscopy of normal and starved cells. ERGIC (ERGIC53) and COPII (SEC31A) appeared adjacent with marginal overlap in untreated cells (Figure 3B,C and Figure 3—figure supplement 1), consistent with previous work reporting a spatial relationship between the ERGIC and ERES where most of COPII coats reside (Witte et al., 2011). Starvation resulted in a qualitative and quantitative increase in the overlap between ERGIC and COPII markers (Figure 3B,C). This redistribution was reduced by inhibition of PI3K activity, consistent with the effect we observed with isolated membranes (Figure 3A). 3D reconstruction of the spatial distribution of ERGIC and COPII through deconvolution microscopy further supported the conclusion (Video 1 and Figure 3—figure supplement 2), demonstrating the starvation-induced and PI3K-dependent recruitment of COPII to ERGIC. 3D deconvolution images showing the distribution of ERGIC and COPII under conditions of untreated, starved or starvation with the PI3K inhibitor. Atg5 KO MEFs were transfected with a plasmid encoding an HA-tagged SEC31A. Immunofluorescence labeling of ERGIC53 (green) and SEC31A (red) was performed as shown in Figure 3B. Z-stack images were collected and deconvolution was performed. 3D images were generated using Imaris imaging software. Cells with conditions of no treatment, starvation and starvation with 20 nM wortmannin were sequentially displayed. Previous genetic and cell imaging studies of COPII as well as the structural analysis of TRAPPIII, a protein tethering complex essential for autophagy, have implied a close relationship between COPII vesicles and autophagosome formation (Hamasaki et al., 2003; Hayashi-Nishino et al., 2009; Lynch-Day et al., 2010; Zoppino et al., 2010; Graef et al., 2013; Suzuki et al., 2013; Tan et al., 2013). Here, we provide direct evidence demonstrating ERGIC-derived COPII vesicles, induced by the autophagic PI3K, serve as a membrane template for LC3 lipidation, a key step in autophagosome biogenesis (Figure 3D). Recent studies indicate the importance of LC3 lipidation in a late step involving the closure of the phagophore membrane to complete the autophagosome (Sou et al., 2008; Kishi-Itakura et al., 2014). Nonetheless, LC3 conjugation was also detected on the small phagophore membranes in the absence of VMP1, an early autophagic factor (Kishi-Itakura et al., 2014). Therefore LC3 lipidation occurs in an early stage of phagophore development even though it may function later. We propose that LC3-lipidated COPII vesicles may fuse homotypically or with membrane derived from other organelles such as the ER, plasma membrane, the ATG9 compartment and mitochondria, to facilitate maturation of the phagophare as well as completion of the double-membrane autophagosome (Figure 3D). Other groups have localized autophagosome biogenesis to a phagophore assembly site (PAS) subdomain of ER (Axe et al., 2008; Hayashi-Nishino et al., 2009; Yla-Anttila et al., 2009; Hamasaki et al., 2013a). The COPII vesicles we have described may contribute membrane to the PAS. ATG14 has been shown to colocalize with LC3 on the phagophore membrane (Itakura et al., 2008; Sun et al., 2008; Matsunaga et al., 2009, 2010; Zhong et al., 2009). We showed that ATG14 and DFCP1 (a PI3P effector, Axe et al., 2008) are recruited to the ERGIC in starved cells (Ge et al., 2013). Therefore, it is possible that ATG14 may remain associated with and direct LC3-lipidated COPII vesicles to the PAS. ERGIC-localized ATG14 may be directly packaged into COPII vesicles active in LC3 lipidation. This association may be reinforced by the high curvature of COPII vesicles (60–80 nm; Kim et al., 2005; Stagg et al., 2008; Zeuschner et al., 2006), which are therefore a preferred binding site for the ATG14 protein (Fan et al., 2011). Alternatively, cytosolic ATG14 may be recruited to COPII vesicles after the budding process. In summary, our data demonstrate a crosstalk between the autophagic PI3K and the COPII machinery leading to the generation of small vesicles derived from the ERGIC membrane that are active as a template in the lipidation of LC3. We suggest that starvation induces the movement of a fraction of SEC12, the key membrane protein required to initiate COPII assembly (Zanetti et al., 2012), from the ER to the ERGIC and that this, coupled to the activation of PI3K, permits the formation of specialized COPII vesicles that serve as the template for lipidation of LC3 and may further feed the growth of the phagophore. Wortmannin, 3-methyladenine, brefeldin A, T7-LC3, GST, SAR1A (H79G), GST-FYVE and GST-FYVE(C/S) were as previously described (Ge et al., 2013). Bafilomycin A1 was purchased from LC Laboratories (Woburn, MA). Control siRNA was as described previously (Ge et al., 2013) and other siRNAs were purchase from Qiagen (Germantown, MD). SiRNAs used were mouse Sec23A (CAGTATTAATATAATGTTTAA, ACGGATGATGTTAGCTTACAA, AAGGATCTGTCTGCCAAACAA and CTCAGTTTATGTTTCATTTAA), human Sec23A (CAGACTCATAATAATATGTAT, CAGAGCCGGTTCTTCTTGATA, CACTACAACCTTAGCCATATA, ATGACGGTTGTAACTACTAAA), mouse FIP200 (CTGGAACAACTTGAAGAACAA, TAGGAACAATAAATTTATTAA, TTCATTGTATATTAACATTTA, CGGCTGGTAAATGAACAGAAA), mouse Atg14 (CTCCATCATATTCCCAATCGA, CCCGTGGATTAGCCTACCAAA, AGGACCTGACATGGAGCATAA, CACATACTTGACATCAATCTT) and mouse Beclin-1 (TTGGTTTGGAAAGATGCTTTA, CGGACAGTTTGGCACAATCAA, CGGGAGTATAGTGAGTTTAAA, TTGGGTAATATTAAACCACAT). The transfection of the siRNA was performed with Lipofectamine RNAiMAX (Invitrogen, Grand Island, NY). Mouse anti-GM130, transferrin receptor, T7 and Tubulin; rabbit anti-SEC22B, Ribophorin 1, ERGIC53, SEC23A, SAR1A, LC3 and Beclin-1 antibodies were described before (Ge et al., 2008; Schindler and Schekman, 2009; Ge et al., 2011). We purchased mouse anti-HA from Covance (Emeryville, CA), mouse anti-LC3 (for immunofluorescence) and rabbit anti-ATG14 from MBL (Woburn, MA), rabbit anti-HA from Cell Signaling (Danvers, MA), rabbit anti-ATG9 from Novus Biologicals (Littleton, CO), rabbit anti-FIP200 from Proteintech (Chicago, IL) and rabbit anti-β-COP from Abcam (Cambridge, MA). The plasmid encoding the HA-tagged human SEC31A was described before (Jin et al., 2012). Atg5 KO and control MEFs (Kuma et al., 2004) were kindly provided by Noboru Mizushima. Reagents and procedures for cell culture were described previously (Ge et al., 2013). For the collection of medium-speed membrane pellet, Atg5 KO MEFs and WT MEFs were cultured, collected and lysed in B88 buffer as described previously (Ge et al., 2013). The lysate was centrifuged at 20K ×g for 10 min and the pellet fraction was washed once by suspending in B88 buffer (10 times volume of the pellet) followed by another centrifugation at 20K ×g for 10 min. For vesicle budding from the lysate of Sec23A knockdown cells, the 20K ×g membrane fraction was washed with 1.5 M urea dissolved in B88 buffer (10 times volume of the pellet) followed by a 20K ×g centrifugation for 10 min. The membrane fraction was further washed with B88 (10 times volume of the pellet) and centrifuged at 20K ×g for 10 min. The final membrane pellet was suspended in B88 lysis buffer (Ge et al., 2013) and the OD600 was adjusted to 10. For membrane fractionation, a three-step fractionation approach was performed (Ge et al., 2013). The indicated membrane fractions were collected by centrifugation and membranes were suspended in B88 lysis buffer to a concentration of 1 mg/ml phosphotidylcholine. Atg5 KO MEF and WT MEF cytosols were prepared as previously described (Ge et al., 2013). For each budding reaction, 5 μl membrane (OD600 = 10 for total membrane; 1 mg/ml phosphotidylcholine for membrane fractionation), 25 μl Atg5 KO MEF cytosol (5 mg/ml), 0.75 μl GTP, 5 μl 10× ATP regeneration (Ge et al., 2013) and indicated drugs or proteins were incubated (GST-tagged protein purification was performed as described previously, Ge et al., 2013). B88 was added last to adjust to a final volume of 50 μl. The reaction was performed at 30°C for 1 hr followed by centrifugation at 20K ×g (for total membrane) or 25K ×g (for membrane fractionation) for 20 min. Supernatant aliquots (35 μl) were transferred to an ultracentrifuge tube for sedimentation at 55K rpm in a Beckman TLA100.3 rotor for 30 min. The supernatant fractions were removed and the small membranes were suspended in a 15 μl mixture containing starved HEK293T cytosol (2 mg/ml), GTP, an ATP regeneration mixture and 0.1 μg T7-LC3 (Ge et al., 2013) and incubated at 30°C for another 1 hr followed by SDS-PAGE and immunoblot to detect T7-LC3 lipidation. These were performed as previously described (Ge et al., 2008, 2011, 2013). Immunofluorescence was performed as previously described (Ge et al., 2008, 2011). Confocal images were acquired with a Zeiss LSM 710 laser confocal scanning microscope (Molecular Imaging Center, UC, Berkeley). Colocalization of the confocal images was calculated by a pixel-based method by ImageJ (Nakamura et al., 2007). For deconvolution, image stacks were collected using a DeltaVision Elite microscope and deconvolution was performed by Huygens Professional 4.5.1p3 software. 3D video and the colocalization histogram of the deconvolution images were generated using Imaris 7.7.1 software (CNR, Biological Imaging Facility, UC, Berkeley). Quantification of the area of LC3 puncta was performed through Analyze Particles function of ImageJ. In brief, a threshold was set to calculate the total area of LC3 puncta which was divided by the area of the cell in the same image. The number was displayed as percentage of LC3 puncta area to the cell area. Journal of Cell Science 119:2173–2183. The Journal of Cell Biology 182:685–701. Nature Reviews Molecular Cell Biology 14:382–392. The New England Journal of Medicine 368:1845–1846. Proceedings of the National Academy of Sciences of USA 108:7769–7774. Current Opinion in Cell Biology 29:18–24. Proceedings of the National Academy of Sciences of USA 108:551–556. Molecular Biology of the Cell 24:2918–2931. Journal of Cell Science 125:1706–1715. Cell Structure and Function 28:49–54. Current Opinion in Cell Biology 25:455–460. Journal of Cell Science 113:587–596. Molecular Biology of the Cell 19:5360–5372. The Journal of Biological Chemistry 280:7758–7768. Journal of Cell Science 127:4089–4102. Nature Reviews Molecular Cell Biology 14:759–774. Proceedings of the National Academy of Sciences of USA 107:7811–7816. The Journal of Cell Biology 190:511–521. The Journal of Cell Biology 152:657–668. Annual Review of Cell and Developmental Biology 27:107–132. The European Journal of Neuroscience 26:3054–3067. International Journal of Cell Biology 2011:713435. Proceedings of the National Academy of Sciences of USA 106:17775–17780. Molecular Biology of the Cell 19:4762–4775. Journal of Cell Science 112:4175–4183. Proceedings of the National Academy of Sciences of USA 105:19211–19216. Journal of Cell Science 126:2534–2544. Proceedings of the National Academy of Sciences of USA 110:19432–19437. The Journal of Cell Biology 155:557–570. Annual Review of Biochemistry 80:125–156. Journal of Cell Science 119:3888–3900. Molecular Biology of the Cell 10:435–453. Thank you for sending your Research advance entitled “Phosphatidylinositol 3-kinase and COPII generate autophagosomal precursors from the ER-Golgi intermediate compartment” for consideration at eLife. Your article has been favorably evaluated by Tony Hunter (Senior editor) and 3 reviewers, one of whom, Noboru Mizushima, is a member of our Board of Reviewing Editors. In the previous report, Ge et al. showed that the ERGIC, which is enriched in the 25KP (25K pellet) membrane fraction, has the highest LC3 lipidation activity. In this follow-up study, the authors demonstrate that the 100KP membrane fraction also has an LC3 lipidation activity. They reveal that lipidation-active small vesicles enriched in the 100KP membrane fraction are generated from the 20KP membranes in a PI3K- and COPII-dependent manner. Finally, they show that COPII components are recruited to the ERGIC during starvation, again in a PI3K-dependent manner. These data suggest that PI3K and COPII are directly involved in generation of LC3 lipidation-active membranes from the ERGIC. This study will advance our understanding of the mechanisms of autophagosome formation. 1) Although the data presented in the manuscript clearly suggest that the 100KP membranes are able to host LC3 lipidation, it is unclear whether these membranes are indeed incorporated in proceeding stages of biogenesis of autophagosomes. The authors should moderate their conclusion, for example in the Abstract, as their data do not support the reconstitution of autophagosome precursors but rather lipidation of LC3. 2) Related to the above criticism, it is important to test at which step endogenous LC3 and other ATGs are incorporated. In their previous paper, they showed colocalization of ERGIC with ATG14 and DFCP1 (Ge et al. 2013). However, this seems not to be the case in the model in the present manuscript. The localization of endogenous LC3-II on COPII vesicles both under starvation and non-starvation conditions should be determined. In addition, if the small vesicle generation assay is performed using wild-type 20KP, does the resulting 100KP contain LC3 and other ATGs? It is also recommended to include an LC3 blot in Figure 3A. 3) In Figure 2, it is clearly shown that lipidation-active 100KP membranes are generated from the 20KP membranes. However, there is no direct evidence that they are indeed derived from the ERGIC. Can the authors deplete the ERGIC membranes from the 25KP membranes as performed in the previous study (Ge et al. 2013) and perform the lipidation assay? 4) Although the requirement for COPII in autophagosome formation in vivo has been suggested in yeast and also in the authors' previous study using the SAR1 mutants, the authors' hypothesis would be strengthened if the authors tested whether starvation-induced autophagy is indeed affected in COPII knock-down cells (e.g. in Sec23 RNAi cells in Figure 2F). 5) Figure 3C should be performed more than n=1 (20 cells were counted from how many independent experiments?) and statistics should be performed. 6) In the Abstract (Figure 1B, Figure 1E) authors say the data are significant. They should provide a statistical analysis to support this. 7) In order to conclude that “autophagic PI3K” induces ERGIC-derived COPII vesicles, it is essential to determine the requirement for Atg14. Otherwise, this should be modified or simply stated as “PI3K”. 8) The authors discuss that LC3-positive COPII vesicles may fuse homotypically or with other membranes to “complete” the formation of autophagosomes. They could be correct that LC3-lipidation is important for the sealing step rather than the elongation step because neither the Atg12 nor Atg8/LC3 system is required for the membrane elongation (Sou et al. Mol Biol Cell. 2008,19:4762, Kishi-Itakura et al. J Cell Sci. 2014, Epub ahead of print). However, as the word “complete” is a little ambiguous, the authors may want to rephrase this sentence. Thank you for resubmitting your Research advance entitled “Phosphatidylinositol 3-kinase and COPII generate LC3 lipidation vesicles from the ER-Golgi intermediate compartment” for further consideration at eLife. Your revised article has been favorably evaluated by Tony Hunter (Senior Editor) and a member of the Board of Reviewing Editors. The authors have done an excellent, more than acceptable job of addressing the previous requests/criticisms. Although this manuscript is now acceptable, we would like to make a small suggestion that could be addressed before publication. Regarding major point #2, the authors previously showed that ERGIC colocalizes with ATG14 and DFCP1 (Ge et al. 2013), whereas the present manuscript suggests that LC3 can be recruited to small vesicles derived from ERGIC. It implies that ATG14 and LC3 do not colocalize with each other. However, many papers have reported that ATG14 colocalizes with LC3 on phagosphores/isolation membranes (Itakura et al. MBC 2008, Matsunaga et al. NCB 2009, Matsunaga et al. JCB 2010, Zhong et al. NCB 2009). It would be helpful for readers if the authors could discuss this apparent discrepancy. Is ATG14 also incorporated into the P100K small vesicles? In addition, it is not clear in Figure 2–figure supplement 6, why the authors cannot test the presence of other ATGs (peripheral proteins) including ATG14 on the small vesicles. Some comment on this would be also helpful. If this experiment is feasible, the authors would be able to provide a clear explanation. The data showing that the small vesicle generation assay also produces Atg9 vesicles are very interesting. We thank the reviewers for the suggestion. Modifications have been made accordingly. 2) Related to the above criticism, it is important to test at which step endogenous LC3 and other ATGs are incorporated. We thank the reviewers for the suggestion. We performed three experiments as described in detail to answer each specific question below (Figure 2–figure supplements 3, 6 and 8). In brief, (1) the generation of LC3 lipidation-active vesicles is dependent on FIP200, ATG14 and Beclin-1, indicating this step could be downstream of the signaling pathway carried out through the FIP200/ULK1 complex and the autophagic PI3K complex (Figure 2–figure supplements 3); (2) The production of LC3 lipidation active vesicles employs a different pathway from those of the ATG9 vesicles, and these two population of vesicles could be generated in parallel in response to autophagic signals (Figure 2–figure supplements 6); (3) The COPII vesicles active in LC3 lipidation may act in an early stage of autophagosome biogenesis as small LC3-positive vesicles instead of big ones colocalize with COPII markers (Figure 2–figure supplements 8). Our future studies will employ the in vitro assays we have developed to reveal details in the mechanism of generation of these vesicles as well as the downstream fusion events needed to complete a double-membrane autophagosome. In their previous paper, they showed colocalization of ERGIC with ATG14 and DFCP1 (Ge et al. 2013). However, this seems not to be the case in the model in the present manuscript. Our current model is in line with our previous study. We showed that ATG14 and DFCP1 colocalized with the ERGIC (Ge et al., 2013) indicating the association of PI3K with the ERGIC as well as the production of autophagy-related PI3P on it. This result together with our current finding that the generation of LC3 lipidation active vesicles is dependent on PI3K and PI3P suggests a model wherein the recruitment of ATG14 together with the PI3K complex to the ERGIC produces PI3P, which is required for the direction of COPII machineries to the ERGIC for the generation of LC3 lipidation active vesicles. The localization of endogenous LC3-II on COPII vesicles both under starvation and non-starvation conditions should be determined. We thank the reviewers for the suggestion. We did the colocalization study of COPII and endogenous LC3 under normal and starved conditions as shown in Figure 2–figure supplement 8 in the revised manuscript. In nutrient-rich conditions, a few LC3 puncta are seen which do not overlap with SEC31A, a COPII component. Starvation induced the dramatic increase of LC3 puncta indicating the stimulation of autophagosome biogenesis. Interestingly, a fraction of small LC3 puncta colocalize with SEC31A, whereas bigger LC3 puncta were separated from SEC31A. The data confirm that COPII vesicles template the lipidation of LC3. Moreover, it also suggests that COPII vesicles may need to become at least partially uncoated to expose the membrane to the LC3 lipidation enzymes. Indeed, bigger LC3 puncta did not overlap with COPII. In addition, if the small vesicle generation assay is performed using wild-type 20KP, does the resulting 100KP contain LC3 and other ATGs? We thank the reviewers for the suggestion. We performed the suggested experiments as shown in Figure 2–figure supplement 6 in the current version of the manuscript. We observed the appearance of LC3-I and -II in the 100K fraction, dependent on PI3K and COPII. As our current budding assay only applies to the determination of integral membrane proteins or luminal proteins, we analyzed the distribution of ATG9, the only transmembrane ATG, in the 100K membrane fraction as shown in the same figure. The appearance of ATG9 in the 100K fraction was not dependent on either the PI3K or COPII, indicating that ATG9-containing vesicles are produced independently. As discussed in the manuscript, these ATG9 vesicles may originate from the trans-Golgi network where the formation of vesicles depends on other protein machineries. It is also recommended to include an LC3 blot in Figure 3A. We performed the LC3 blot. However, we did not detect any LC3 signal in the membrane fraction (data not shown) possibly because in Atg5KO MEF LC3-I could not strongly associate with membrane. Therefore it dissociated from the membrane during the three-step fractionation. We thank the reviewers for the suggestion. We performed an immunodepletion experiment as shown in Figure 2–figure supplement 4 in the revised manuscript. Removal of ERGIC by SEC22B antibody depletion abolished the generation of small vesicles active in LC3 lipidation, hence confirming the ERGIC as the membrane to generate these vesicles. We thank the reviewers for the suggestion. We did Sec23A RNAi experiments as shown in Figure 2–figure supplement 7 (the effect of Sec23A knockdown on autophagosome biogenesis) and Figure 2–figure supplement 5B, C (RNAi efficiency) in the revised manuscript. Depletion of SEC23A in WT MEF and Hela cells decreased starvation-induced LC3 lipidation as well as LC3 puncta formation. Therefore, COPII vesicles are involved in the biogenesis of the autophagosome. We thank the reviewers for the suggestion. We have indicated the number of experiments in the figure legends and T-tests were performed for statistics. We thank the reviewers for the suggestion. These data are representative of at least three experiments. Instead of showing statistical data to reconcile the word “significant”, we have employed a quantitative description in the current manuscript, which we think better describes the data. We thank the reviewers for the suggestion. We performed RNAi experiments to deplete FIP200 (one essential upstream factor) as well as ATG14 and Beclin-1 (key components of the autophagic PI3K complex) individually in Atg5KO MEF. As shown in Figure 2–figure supplement 3, cytosol collected from the autophagic factor-depleted cells displayed compromised activity to generate LC3 lipidation-active vesicles in the small vesicle generation assay, indicating the requirement of these upstream autophagic factors. Therefore, the data support the involvement of autophagic factors such as FIP200 and components of the autophagic PI3K in the induction of ERGIC-derived COPII vesicles. For the purpose of accurate description, we have removed “autophagic” from “autophagic PI3K” before Figure 2–figure supplement 3 in the text. However, we kept “autophagic” that appears after Figure 2–figure supplement 3, as this figure indicates the role of autophagic PI3K as well as upstream factors in this process. We thank the reviewers for the suggestion. Modifications have been made and the references have been added. We thank the reviewers for the suggestion. Our conclusions may be complementary rather than contradictory to those of other researchers. Our studies indicate that the ERGIC-localized PI3K functions to generate small vesicles as one template for LC3 lipidation and other researchers reported the colocalization of ATG14 with LC3-decorated phagophore. 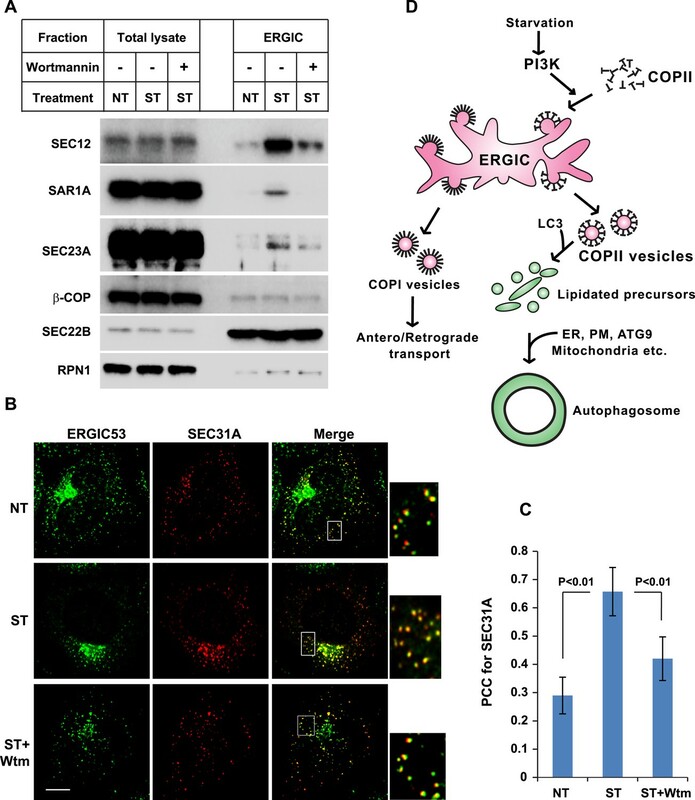 These data suggest a sequential role of ATG14 in autophagosome formation wherein it promotes the generation of LC3 lipidation-active vesicles from the ERGIC after which it may remain on these vesicles to provide one essential membrane for phagophore growth. COPII vesicles are small (60-80 nm) and highly curved and are thus ideal membrane targets for ATG14, which favors highly curved membrane (Fan et al., 2011). ERGIC-derived ATG14 may be packaged into COPII vesicles and remain associated through the process of lipidation and carried forward to the creation of the PAS by the fusion of vesicles including those that carry ATG9. Alternatively, cytosolic ATG14 may be recruited to LC3 lipidation-active or LC3-lipidated vesicles after budding from the ERGIC. Either possibility requires the determination of ATG14 in the 100 KP COPII vesicle fraction. Unfortunately, our current assay could not reliably determine the level of ATG14 in the COPII fraction as cytosolic ATG14 and most of the ATGs tested sedimented in the 100k pellet fraction, which complicated our assessment of the origin of this pool of ATG proteins. This determination requires further effort, which we feel goes beyond the scope of our Advance report. We have included the above information in the revised manuscript as suggested by the reviewers. RS: Editor in Chief, eLife. We thank Noboru Mizushima (University of Tokyo), Beth Levine (UT Southwestern Medical Center), James Hurley (UC Berkeley), Roberto Zoncu (UC Berkeley), Susan Ferro-Novick (UC San Diego) and Li Yu (Tsinghua University) for reagents, helpful discussion and advice, Steven Ruzin and Amita Gorur (UC Berkeley) for guidance on deconvolution, Bob Lesch, Ann Fischer and David Melville (UC Berkeley) for technical assistance. LG is supported by a fellowship from the Jane Coffin Childs Fund (JCCF). MZ is a research associate of HHMI. RS is an Investigator of the HHMI and a Senior Fellow of the UC Berkeley Miller Institute. © 2014, Ge et al. Autophagy is a catabolic process for bulk degradation of cytosolic materials mediated by double-membraned autophagosomes. The membrane determinant to initiate the formation of autophagosomes remains elusive. Here, we establish a cell-free assay based on LC3 lipidation to define the organelle membrane supporting early autophagosome formation. In vitro LC3 lipidation requires energy and is subject to regulation by the pathways modulating autophagy in vivo. We developed a systematic membrane isolation scheme to identify the endoplasmic reticulum–Golgi intermediate compartment (ERGIC) as a primary membrane source both necessary and sufficient to trigger LC3 lipidation in vitro. Functional studies demonstrate that the ERGIC is required for autophagosome biogenesis in vivo. Moreover, we find that the ERGIC acts by recruiting the early autophagosome marker ATG14, a critical step for the generation of preautophagosomal membranes.